Man, Avengers: Infinity War was a heck of a film, huh? We’ve waited a whole ten years to finally see Thanos assemble the Infinity Gem Stones and Marvel didn’t let us down! It was a great film and I loved it, even that gut punch at the end where the bad guy actually won. This surprising denouement where we saw a lot of our favorite characters and not so well-known heroes (Vision, Scarlet Witch and Mantis, I hardly knew you) bite the dust might have been jarring for non-comic book fans. They’re probably scratching their heads as to why Marvel would kill off characters like Spider-Man and Black Panther, especially after their movies were such huge blockbusters. This isn’t a question that isn’t worth answering for comic book fans as we know that Marvel will have some convoluted story that’ll resurrect most, if not all of them in the next Avengers film. At least, that’s what I’m expecting. Oh, the wait will be agonizing but it’s safe to say that they’ll be back. So, while I may not be asking what Marvel was thinking of when they “killed” some of the heroes, I do have a few questions specifically about some of the events and things that happened in Avengers: Infinity War. They may not be major points, though. Rather, these are some of the inconsequential questions that popped into my head while I was watching the film. Oh, I have to give the obligatory SPOILER warning as I will be talking about some specific stuff about Avengers: Infinity War. 1. How did Thanos and The Black Order track the Infinity Stones? Avengers: Infinity War starts practically where Thor: Ragnarok ends. Thanos and his Black Order have boarded the Thor’s ship and decimated most of the Asgardians. His attack isn’t just happenstance as well as the Mad Titan has figured out that Loki has the Tesseract in his possession. After extracting the Space Stone from the Tesseract, Thanos sends the Black Order to retrieve the remaining Infinity Stones. Ebony Maw and Cull Obsidian attack New York to get the Time Stone from Doctor Strange while Proxima Midnight and Corvus Glaive head to Scotland as Vision, who has the Mind Stone embedded in his forehead, meets up with Wanda/Scarlett Witch. Later in the film, Thanos’ forces converge on Wakanda as this is where Vision was taken. Now, here’s my question: how did Thanos, or the Black Order for that matter, know precisely where the Infinity Stones were? It’s one thing to know what planet the Infinity Stones are in but the exact location? I guess the locations could have been revealed to them after Thanos got the Space Stone from Loki. However, how the heck did Thanos know where the Space Stone was in the first place? Did he just get lucky as he ran into Loki in the great blackness of the galaxy and it just so happened he had the exact item he wanted? Does Thanos and the Black Order have some kind of Infinity Stones radar like in Dragon Ball Z? If the did, why didn’t Thanos use whatever technique he used to find the other Infinity Stones to locate the Soul Stone? 2. Why didn’t Gamora do anything with the knowledge of where the Soul Stone was? When I wrote up my spoiler free review of Avengers: Infinity War, I mentioned that one of the things I disliked about the film are a couple of the plot conveniences that popped up. Strangely enough, a lot of them have to deal with Gamora and Thanos’ relationship. I already thought it was strange for Thanos to bring Gamora to Vormir to retrieve the Soul Stone but, then again, it just so happened that she was the most appropriate sacrifice needed for the Mad Titan to get what he wanted. But the weirdest thing that really struck me is that Gamora apparently knew where the Soul Stone was all this time? My biggest problem with Gamora knowing where the Soul Stone was all this time wasn’t how convenient it was to the plot but that she didn’t do anything with that information! She essentially knew where one of the most powerful objects in the galaxy was and she kept that information all to herself. Sure, she burned the map with that bit of knowledge in the hopes that Thanos would never figure out where it was but, if she really wanted to keep it safe, shouldn’t Gamora have tried to get it and move it to a totally new location just in case? Okay, she wouldn’t have been able to get it as she would need to sacrifice something she loved to get it but, since she was gloating all about that Thanos couldn’t get it because he didn’t love anything, it’s obvious that Gamora didn’t even try. If she really wanted all information as to the whereabouts of the Soul Stone, why the heck did she read the map herself before burning it as well? Or, since she trusted the Nova Corps with the Power Stone, why didn’t she direct them to get the Soul Stone for safekeeping? 3. Why didn’t the Guardians of the Galaxy know about the attack on Xandar? By the start of Avengers: Infinity War, Thanos has apparently decimated Xandar and obtained the Power Stone from the Nova Corps. Since this is Thanos and he has a hard on for killing and destroying stuff, I’m betting he didn’t get it through peaceful negotiations. More probably, he performed an all-out attack on Xandar to get it, which I would assume would be huge news in the galaxy. 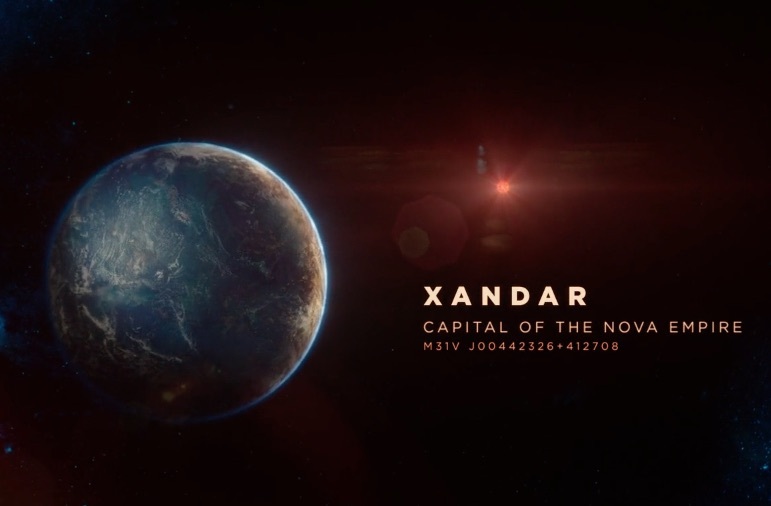 At the very least, Xandar would’ve broadcast a distress alert to the cosmos for help, right? In either case, wasn’t it odd that the Guardians of the Galaxy didn’t know anything about the capital of the Nova Empire getting attacked? Current Population: Exactly half of what it was a week ago. And don’t tell me broadcasts don’t happen instantaneously in the Marvel Cinematic Universe because they do! In the previous Guardians of the Galaxy films, there were news broadcasts regarding Ronan the Accuser’s attacks on the Nova Empire’s colonies and subspace video communications that happen seamlessly across galaxies. In fact, the reason why the Guardians of the Galaxy found Thor in the first place was because they were responding to the Asgardian distress call! You’re telling me Xandar didn’t do the same? 4. Why didn’t Doctor Strange just portal himself home? It’s hard to be specific regarding Doctor Strange’s powers. That’s because he’s the Sorcerer Supreme and you can pretty much give him any power and just say “it’s magic” and no one will question you. However, the movie where he first appeared did give him some distinct abilities. He can fly using the Cloak of Levitation. He can control time using the Eye of Agamotto (which is actually the Time Stone). He can shoot out blasts of energy from his hands as well. However, one of Doctor Strange’s more memorable powers is his ability to travel to different location instantly using the sling ring. Now that we have that established, in Avengers: Infinity War, Doctor Strange gets captured by Ebony Maw. He’s eventually freed by Iron Man and Spider-Man. Doctor Strange then demands that Tony Stark take control of the spaceship and go back to Earth. Well, why the heck would Doctor Strange need someone to pilot a ship for him when he can just create a portal back to Earth? Initially, I thought this was because Doctor Strange didn’t have his sling ring on him. That would mean he couldn’t create a portal himself and would definitely need someone to help him. Yet, when he, alongside Iron Man, Spider-Man, Star-Lord, Drax, Mantis and Nebula fought against Thanos in an attempt to relieve the big baddie of the Infinity Gauntlet, you can clearly see him creating portals to move the heroes around! So, he could’ve just created his own way home then! So, why didn’t he just go home via portal? Did he forget he can do that? 5. Why doesn’t Thanos make more food/water/resources with the Infinity Gauntlet? At last we come to probably the biggest question I have for Avengers: Infinity War and that’s Thanos’ goal. He wants to obtain the Infinity Stones and fuse them into the Infinity Gauntlet so that he can wipe out half the universe’s population. He’s not doing this for evil purposes. Rather, he wants to reduce the universe’s population in the hopes that we can extend our finite resources. His idea is that, by having less people, there wouldn’t be food shortages or anything like that. Let’s forget that this is pretty much Richmond Valentine’s plan in Kingsmen: The Secret Service but on a global scale for now. Of course, Thanos could just go to all the different planets and cull their populations by half but that would take time and a whole lot of resources. So, the Mad Titan plans to use the Infinity Gauntlet to do this “at the snap of his fingers,” which he did at the end of Avengers: Infinity War! Now, I get his intentions but, if you have the power to bend all of time, space and reality to your will, why go cut the universe’s population by half when you can simply quadruple the universe’s food/water/resources in an instant? In the comics, the Infinity Gauntlet miniseries, I totally understood why Thanos wanted to do a whole lot of killing. It was to impress the personification of Death. In Infinity War, there isn’t a need to kill! Thanos could’ve just made everyone more mindful of wasting resources with the Mind Stone and/or the Soul Stone! He could’ve made more stuff with the Space Stone and Reality Stone! He could make plants and food grow more rapidly with the Time Stone! Killing half the universe’s population just seems messy in retrospect, doesn’t it? BONUS: Why does Thanos turn things into bubbles? I like bubbles. You like bubbles. Everyone likes bubbles! Even so, I found it rather strange that Thanos’ main go to when it came to transforming things into different objects is bubbles. Sure, bubbles are cool but why change Star-Lord’s blaster into a bubble gun? Why does Thanos love bubbles? Okay, it makes sense to me now. Do you have any questions after watching Avengers: Infinity War? Let me know what they are in the comments below! ← Avengers: Infinity War Spoiler Talk!